RUSH: We start on the phones at Worcester, Massachusetts. This is Alex. Great to have you, sir. How you doing? RUSH: You bet! I’m glad that we got somebody from Massachusetts here that is actually out of bed and talking today. CALLER: Just trying to stay alive up here in the people’s republic. RUSH: “Just trying…” Well, yeah, but, I mean, you’re dealing with the Patriots loss is what I was referring to, an earth-shattering event. You thought you were gonna win the eighth Super Bowl — or sixth Super Bowl out there. Anyway, it’s great to hear that you’re unaffected by it. What do we owe the pleasure of your call to? CALLER: Well, Rush, I was listening to you and I was thinking that it used to be that we were worried about our adversaries were a foreign government spreading false information to influence an election, but now it seems like what we’re worrying about is that they’ll spread the truth. RUSH: Uhhh, explain what you mean. I may… Yeah, explain what you mean. CALLER: Well, Rush, you were talking about how the left believes that Trump colluded with Putin to steal the election. And I heard you say that, and it just… You know, I was grinding my teeth a bit, because nobody thinks that the president passed any fake ballots or changed any vote totals. What people think is that true information about the DNC and the Clinton campaign and the things they were doing came out, and because of that, people decided to vote for Trump. Since when is the truth a bad thing? Since when is the truth stealing an election? RUSH: Well, you know, you ask that question facetiously, but if the truth is going to damage the cause of the Democrat Party, then it’s not a good thing. But let… I’m gonna take the occasion of your call to expand the universe what we’re talking about here. From the time I was old enough to know what was going on — which was nine, 1960. My memories are filled with details of that presidential campaign, and then 1964 as well. I come from a very politically involved family, and one of the great fears and concerns when I was growing up among peopling on the right was Soviet/communist infiltration of many parts of America: schools, religion, and universities as well. Back then, the threat of Soviet infiltration — which was real — was ignored by the Democrat Party. It was pooh-poohed. It was laughed at. It was considered to be ridiculous. Besides, the Soviet Union was not really an archenemy to the Democrat Party. The Democrat Party’s always had its leftist leanings. In fact, when I was growing up, it was not nearly as radical leftist as the Democrat Party is today. But when I was growing up, it was our side warning about Soviet infiltration, taking over the education system, trying to wipe God out of as much of American public life as possible. There was a book by Nelson DeMille called The Charm School. It was a novel, but it was true. The Soviets actually trained agents to move to America and live and work and operate as Americans. They spoke perfect American English. They had American jobs. They lived outside Washington. But they were KGB spies. It’s just one of many programs. The point about this is that whenever any of us alluded to this possibility and warned of its consequences, we were mocked! We were laughed at. We were told that we were chasing ghosts. We were told it’s conspiracy theory time. Now? Now look at what’s happening. But he raises a great point. What is the thing here? If there was a conspiracy, if Trump and Putin actually did collude, what did they do? I mean, the Democrats want everybody to believe the election is illegitimate. Okay, how? You note they do not specify how the vote was tampered with or ballots were tampered with. They don’t, because it’s not possible. The Russians could not tamper with ballot boxes or votes any more than the Democrat Party already does. So when you hear the phrase that the Russians colluded with Trump to affect the outcome of the election, what did Trump and the Russians do? What do you think it means? Our caller here is saying that what the Democrats think is that the Russians were behind the hack of the DNC servers that led to the Podesta emails being made public. But that isn’t true. The Podesta emails were not the result of a Russian hack. They were the result of Podesta making a stupid move, clicking on a bad link in a phishing email. But stop and think. Seriously. What is the collusion? What is the conspiracy? What did Trump and the Russians do to deny Hillary the election? Did they put a bunch of bots out there on social media, making fun of Hillary, criticizing Hillary? Did they affect the way people voted with phony PR schemes and so forth? What did they do? And I’m here to tell you that there’s not a single person that can answer that for you. That’s how specious this is. But, my friends, all of this is academic. And by that, I mean irrelevant. There is so much about all this that it’s entirely impossible to keep it all front and center in one’s mind. But do you remember the book that was written about the Clinton campaign by Jonathan Allen and Amie Parnes? Do you remember that I have called attention to the fact that in this book the story is told about how Hillary and her team — 24 hours after her concession speech — devised and came up with the explanation that the Russians tampered with the election? Here is the passage from that book: “Within 24 hours of her concession speech, campaign chairman John Podesta and the campaign manager, Robby Mook, assembled Hillary’s communications team at their Brooklyn headquarters to engineer the case that the election was not entirely on the up and up. “For a couple of hours, they went over the script they would pitch to the press and the public. Already Russian hacking was the centerpiece of the argument.” The point is, we know that the Hillary presidential campaign paid for the dossier. We know that the FISA court was not told this. We know that the Hillary campaign paid for what essentially was a slime job on Trump. It was opposition research packaged to look like legitimate intelligence. This happened before the election. So Hillary and her campaign team pay for this opposition research that results in the Steele dossier, and then 24 hours after Hillary conceded, her campaign team got together and prepared the script or the strategy that they would pitch to the press and the public about how the election wasn’t legit. It wasn’t on the up and up. It was 24 hours after Hillary conceded that the plan was implemented and conceived, and the plan was to steer the media into covering how Russian hacking was the most unreported story of the campaign. And they, of course, followed suit. Whatever the Hillary campaign told them, they followed, because the mainstream media — of course — is on Hillary’s team. So after the election, this mythical, made-up, strategized story of Russian collusion began to fill the news media. And after that happened is when the deep state got involved and started providing daily anonymous source leaks to CNN, the New York Times, and the Washington Post. And in every one of those stories for the next six weeks, every one of them, there was a line somewhere in the story that no evidence yet has been found, but sources close to the story say… and then they lie. They continued to push this narrative that Trump and Russia colluded. 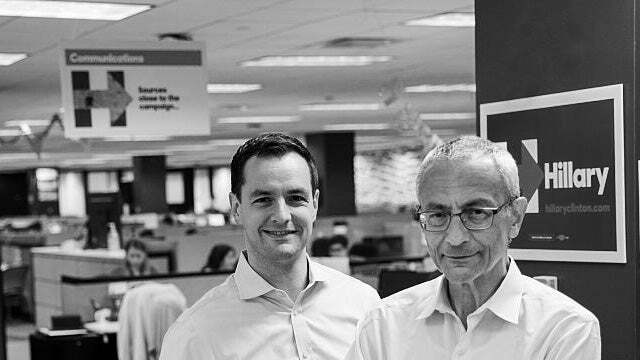 It was hatched by the Hillary campaign team 24 hours after the election, after her concession speech, and it’s there in the book by these two reporters that chronicled the Hillary campaign. And of course they didn’t report this when they found out about it. They didn’t report this 25 hours after Hillary’s concession speech. They reported on it some months later when the book came out. So we know this whole thing has been made up. And all of this ended up being used as supporting evidence to secure a warrant to spy on Carter Page, and then that warrant was renewed three times for 90 days each. And Carter Page hasn’t been indicted. I mean, all of this is made up. And yet there remain people on our side — it’s mind-boggling to me — there remain people on our side who will not yet conclude that there’s nothing to the Trump-Russia collusion story. They believe there might be because too many in the media have put their reputations on the line reporting it. They believe that it’s got to have some element of truth to it. Even if it isn’t very much, there’s gotta be something to it; they wouldn’t be reporting it otherwise. It’s the most amazing thing, which just means that still there are a lot of people on our side who still don’t understand exactly what we are up against. By “we,” I mean the country.